Tomorrow is a sad anniversary! What do you remember about hearing the news and your reactions? The tragic loss undermined my trust in progress and technology. Optimism was replaced by doubt… even the bravest and most brilliant sometimes fail. 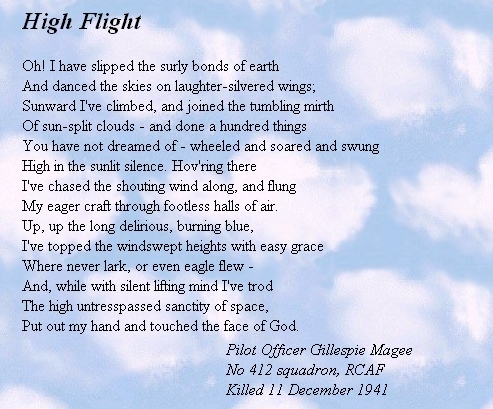 Just three months later, on December 11, 1941 (and only three days after the US entered the war), Pilot Officer John Gillespie Magee, Jr., was killed. The Spitfire V he was flying, VZ-H, collided with an Oxford Trainer from Cranwell Airfield while over Tangmere, England. The two planes were flying in the clouds and neither saw the other. He was just 19 years old. He is buried in the churchyard cemetery at Scopwick, Lincolnshire. Linked here. I was born in 1941, and my father was in the RCAF. My parents lived courageously through terrible times. Yours probably did also. Perhaps, in some way, we all do. This entry was posted in Uncategorized and tagged Canada, family, history, music, NASA, poetry, society, technology. Bookmark the permalink.